It’s the best time of the year! The pohutukawas are in bloom, the water is warm and Christmas is just around the corner. Here’s a link to the tide chart and surf forecast. call Jo Adams 0274 493 034 if you find the remains of a beach fire, he will extinguish any embers. There will be no back up for the Onemana Rural Fire Force in the busy holiday period, if a fire catches in the forest the chances of stopping it are very slim. Please read on for more information from TCDC regarding fire. Get out your diary and make a note of these upcoming events in Opoutere. Come along to Bruce’s Bay at 2pm Thursday 28th December. The fun begins with a bucket competition for the under-5s then it gets serious with swimming and kayaking races for young and old. Prize giving at 5pm in the Michael King Reserve over the road. Thanks to Shan and Gavin for organising the event. Check out the colourful 2017 Regatta Notice on the bus shelter. 9.30am Tuesday 2nd January 2018, at Opoutere School. Follow this link to the ORRA AGM 2018 AGENDA. Opoutere Working Bees coming right up! Yes, it’s time. The birds are singing and mating as they are very happy out on the spit now. The rat population is pretty close to zero ( a recent DOC monitoring program showed zero rats out on the spit in our trapping area). Not to mention no recent signs of possums, just rabbits now. But the problem with this is that the bird life has increase significantly and they love to spread ginger seeds and ginger is getting ready to flower, NOW is the time for us to get stuck into some working bees out on the spit. First one is this Saturday at 8 30 am. I recently mapped out the area of one larger ginger patch and it was 6000 M² with around 75% coverage over this area – which is a bit of ginger , There is a second area nearby which I haven’t scouted yet but probably 4000 M², Which is quite a significant amount of ginger which needs to be removed. What we do is cut and paste and cut and paste and more cutting and pasting , I have a few knives but any good sharp knife will help, I have many bottles of paste to stop them regrowing back. Suitable for all ages, children most welcome as there is a lot of baby ginger which can be pulled by hand and then placed in black plastic bags to rot away – as these plants will grow back. This is a fun couple of hours and you get a real sense of achievement at the end as you look back on what we have done – the last one we cleared about 1000 M² so we will get on top of it. If we don’t it will overtake the whole spit. This ginger patch is pretty well right in the middle of the spit ( pic below), I have made a track into the middle from the seaward side of the spit loop track. Head from the carpark towards the beach and just before you get to the beach turn right walk past the DOC track closed sign and the orange netting , under the fallen pine and about 200 meters further along the track you will see a traffic safety cone – turn right and follow the red marking tape and the yellow rope on the ground until you find me in the middle of some ginger. The area we will be working is away from the poisoned pines. Please wear gloves and good footwear and sign the book before you start work it will be at the start of the track – please sign again on your way out , so we can keep track of you while you are out working. My number is 021 418119 if you get lost or have any questions. Don’t forget the ORRA agm which is coming up on the 2th Jan , I will be giving my yearly review of our pest control work in Opoutere. Kerbside rubbish collections increase from December 27 2017 until February 10 2018. Our summer Total Fire Ban is in place from tomorrow (20 December) across the Coromandel, which means open fires in public places, beaches, public conservation land (DOC) and on private property are not permitted. We could be in for a hot, dry summer which means an elevated fire risk as vegetation and soil dries out. The Total Fire Ban runs from 20 December 2017 until 8 February 2018 and can be extended if the dry weather continues. The ban includes land-clearing fires, rubbish fires, traditional cooking and hangi fires, bonfires, solid-fuelled BBQs, braziers, domestic fireworks, Chinese lanterns, and open-top incinerators. It does not include gas-fuelled cookers or gas BBQs provided they are operated by an adult in a safe manner. If you see an out-of-control fire, call Fire and Emergency New Zealand on 111. Bush fires, like that which burned through about 100 hectares of land at Comers Road in Mercury Bay in January this year (see photo below), put lives in danger and destroy property and habitat for native plant and animal species. “The Comers Rd fire is a prime example of why we have a Total Fire Ban across the Coromandel during the summer. 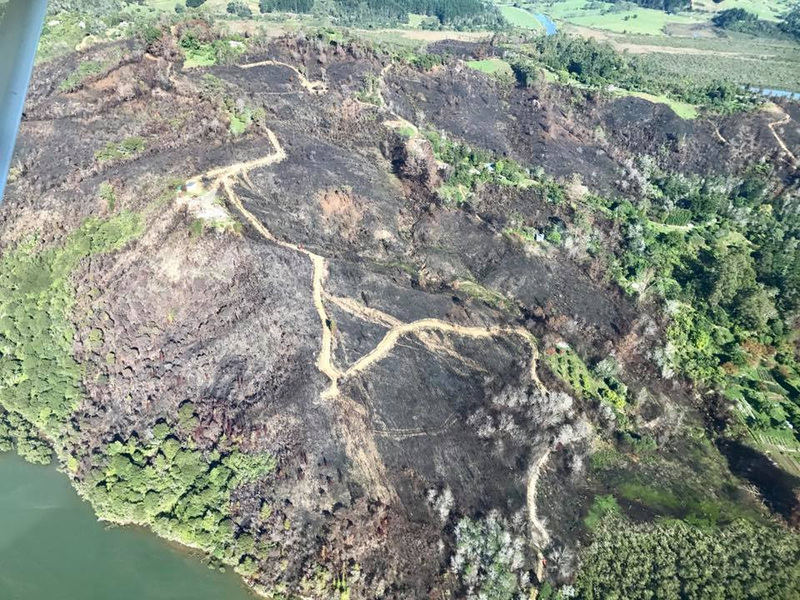 This shows how damaging a fire in the bush can be,” says Paul Shaw, the Waikato Principal Rural Fire Officer. You can take action now to reduce the risk to your property from fire. Make sure your property has good access for fire trucks, and to water supplies. Have a well-practiced escape plan so everyone knows what to do if there is a fire. Call 111 immediately if you see any smoke. Store firewood in a cool dry place, not next to your home. It will dry out with the sun and heat and ignite easily. Be vigilant when working with machinery that could throw sparks and ignite a fire. Dampen down the surrounding area beforehand, and do the work first thing in the morning when it is coolest. Remember to check the fire season at www.checkitsalright.nz as these activities may be fully prohibited due to the high risk of them starting a fire. Use Fire and Emergency New Zealand’s fire safety checklist to help make sure your property is safe from vegetation fires this summer. During the busiest days of the holiday season the Opoutere community does a great job protecting the dotterels’ feeding time on the spit at low tide. We work cooperatively with Frouk Miller, the hard-working DoC Dotterel Ranger for our area. Volunteers sign up to do a couple of hours by the spit barrier keeping an eye out for people who may not be aware of the dotterels feeding needs at nesting time. When disturbed by people and/or dogs the birds on the spit can take fright and abandon their nests, tragically chicks can try to follow their parents and drown or are simply left to starve. Please join us in this work by signing up to the Dotterel roster on the bus shelter, we would love to have your help! For any questions or concerns about the Dotterel Watch programme, please contact Frouk at fmiller@doc.govt.nz. HAVE A WONDERFUL CHRISTMAS AND TAKE CARE OF YOURSELVES!